Using an automated timekeeping application and equipment is only a small part of providing successful event result service experience to your event's participants and spectators at event site as well as to chair viewers at home. This material provides information to above steps 5. and 6. Also all other steps must be taken care of. 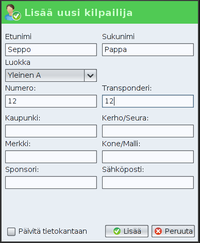 Screenshot of support.enymind.fi service. Click Download to load the installation media to your hard drive. To download software go to http://support.enymind.fi and log in. Username and password will be provided with the license order confirmation email. Screenshot of starting screen. After loading all components software starts. After the installation, the installation program has created icons for programs on your computer desktop. Start the software on your computer by clicking the shortcut on the desktop. During the first start program, it may take longer, up to 60 seconds. The program creates a necessary first start-up settings, and databases on the hard disk of the computer. If the time of the operating system is automatically synchronization via the Internet, you should synchronize it manually as soon as the machine is started before starting J2Chrono program. Another option is to disable automatic synchronization. An accurate time of the day does not matter if you use just one computer to make the results. If you have two or more computers those all must use exactly same time. After the software have been launched for the first time you will have to do some configuration before usage. Initially, each software must be registered in order to be able to communicate with each other and other network services in the future. The credentials are same as those used at the download page. You can access registration from top menu of each software. Name of the registered instance must have an unique name, like "computer 1"
The formula is <number><space><number><space><number> and so on. Enter a name, result scheme, point scheme, and clock type. Use result scheme according to type of competition; if only one timeline use "Track" and for multiple timelines use "Route"
Use clock type according to type of competition; when mass start use "Timer" and any other type of start or when multiple timelines use "Realtime"
ChronoFly program will not be used in track type sports where there is only one timeline. In track type sports you can operate everything and create results using only J2Chrono. Route type sports you need start-finish pairs and other type of timelines which are managed with ChronoFly program. ChronoFly sends individual times to J2Chrono where they are processed further to create results. Timing of the first competition a challenging situation. We recommend not to leave the studying of J2chrono software to the last minute when it is time to create real results for real event. Please do studying beforehand and arrange some pilot events first to get yourselves familiar with the software. 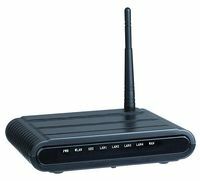 Photo of wireless network router. In track type sports you often do not have to worry about data communications because all timing functions are operated in one computer with exception of transmitting the results after the competition to the club website or other service that requires Internet access. For Internet access you need additional equipment, such as 3G dongle and subscription from your Internet operator. In route type sports data communication must be taken into account the, eg. transferring times from one timeline to another. All of these timing functions are often located at different computers and times needs to be moved with ease from machine to machine. If the computers are located in close proximity of each other (less than 200 meters radius) you can use local LAN solutions such as ethernet cabling or wireless local area network (WLAN). If the distance is longer it is necessary to transfer the data through public network (mobile Internet, 3G, etc ..). The use of public networks require additional equipment such as 3G dongle and a subscription from the Internet operator. Creating fully working large scale WiFi network to the event site is a job of a specially skilled person. ChronoFly network settings. The address is the IP of computer operating J2Chrono software. In Local Area Network computers are connected to each other using IP addresses. The important thing is to figure out IP address of a computer operating J2Chrono software which is why you should use only fixed addressing. Other programs (like ChronoFly) will send the times to this address for further processing. Computer's IP address can be set to other programs, such as ChronoFly, using application settings. In case of Public networks please use either a VPN solution or a live sync function through which information can be transferred through the Internet safely between timekeeping stations (ChronoFly) and J2Chrono. In this case IP addresses does not really matter because mobile Internet rarely has public IP addresses. The programs must be set to act by way of you event. For each event you must create a new competition as every race is different at least what comes to participants. One of the most crucial setting is "Bring competitors automatically". This where you select whether you want participants to be selected manually before the start of the race or bring participants automatically during the race. Other options are not mandatory. After adding of the race program will create one round called "First round". The user must either delete or rename it according the event. Also one top-level item "Parent round" is created. The top level item can not be deleted. You can add, edit, and delete an existing round by press the mouse 2nd button over the tree. In track sports it is essential that each round is it's own race. Examples: Exercise 1, Exercise 2, Qualifying 1, Qualifying 2, Round 1, Round 2, etc. The most relevant information is the name of the round and it's time. Time is not the duration of the round, but it is estimated start time of the round in race schedule. You can also select some settings which affect rankings like the maximum approved number of laps, and whether the first track would be a complete lap or not. Competitors may be added either individually or import them pre-filled spreadsheet (Microsoft Excel, OpenOffice Calc) etc. Use .csv format when importing. All competitors are added. Each competitor has its own transponder number set. The race has all necessary rounds / timelines with the correct settings. Check the functionality of peripherals (printer, 3G dongle) of your computer. Internet connection should only be tested at the event site as the reliability of mobile Internet will vary a lot between different locations. Screenshot track type items. The selection is Round 1. In Track sports check that the correct round is selected. The selected round is shown as bold text in relation to other rounds. If you gave the time according to the schedule of race rounds will also appear in order. The selected item you can change the mouse by double-clicking. However, do not replace the item among the chronograph, but only between batches. At the start of each round be sure to start the stopwatch. In Route sports check that the data transmission works flawlessly between ChronoFly timekeeping stations and the J2Chrono. If you have a reader or decoder check that it is turned on and that the program has noticed its existence and the connection is established. When the first round has started and the stopwatch is also started you can move steps bellow. The most crucial thing during the timekeeping is to monitor that everything works flawlessly. Each competitor must get a time in one way or the other when one passes timeline. The time can either be automatic from a reader/decoder or manually entered. Manually entered time accuracy is always worse when compared to automatic. Always practice how you can add a manual time to time station (ChronoFly) software. Hint: F1 or Ctrl. Adding, editing and removing print layouts. Reporting and printing the results can be done with Reporting window which can be opened from left menu of J2Chrono. At every reporting window there is Print button which opens a new Print dialog box. Screenshot of live settings at J2Chrono. Also results can be added to Live afterwards by pressing the mouse 2nd on top of the desired round and selecting "Sync results to live". Screenshot of Live settings at ChronoFly. 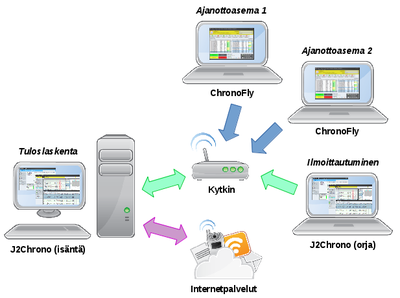 It is possible to use Live to transfer data between timing stations and J2Chrono. In this case at J2Chrono settings you must enable "Fetch times from live server". In addition ChronoFly must also be set to send times to Live service. Set TCP/IP protocol to "chronocloud", add live address, and live password. Final results can be created with Reporting window. From the top menu of the Reporting window you find appropriate screens to process and print the results, lap times, and other necessary data of the race. Results can be printed or transferred to spreadsheet program for further processing. Results can also be saved in HTML format for publishing at the Internet. Read reader equipment manufacturer's own user manual to figure out how they work.